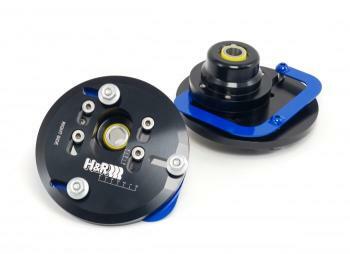 If you have been looking for a camber plate that does it “all”, look no further than the H&R BMW M3 (E46) camber plate. These gems look like they belong on a space shuttle — CNC machined from aircraft grade aluminum billet and finished with Mil spec hard anodizing. Each steel part is powder coated and stainless hardware is included for beauty and corrosion protection. Having undergone rigorous track testing and stress analyzation, these race-winning camber plates have set the precedent for all others.